Though it is an endangered spectacle in today's taverns, foosball was once king among bar games, attracting hustlers and spawning tournaments that paid out hundreds of thousands in prize winnings. "Play a little foosball?... All riiiiight." Drinking. It's an important adjunct to sports. Whether you're hammering back Jägermeister at the pre-game tailgate, guzzling overpriced, watered-down suds at the ballpark, or even hosing down a teammate with cheap champagne during a victory celebration, it's clear that alcohol and sports have a long-standing, intimate relationship. So intimate, in fact, that Major League Baseball has recently been forced to re-examine its policies, with some clubs -- including the St. Louis Cardinals -- deciding to ban drinking in the clubhouse after that team's pitcher, Josh Hancock, was killed in an accident while driving drunk. That baseball clubhouses, those rarified sanctuaries of athletic prowess, have been traditional hotbeds of booze bingeing may surprise some, but it's unlikely that anyone familiar with Babe Ruth and his legendary liver would raise an eyebrow at such a revelation. Similarly, it's not surprising to realize that, as alcohol has soaked into the stands and clubhouses of both major and minor sports, so have sports -- well, at least "games" -- crept into our bars and taverns, giving us new and exciting ways to while away the hours as we -- well, at least I -- slip inexorably into a drunken stupor. Notice that the initial consumption of drink is likely to relax your nerves and improve your concentration, blocking out performance-inhibiting anxiety that might otherwise send the cue ball off its target, or direct your Pac-Man toward the ghosts rather than away from them. As the drinking continues, however, an interesting bell curve becomes apparent, as the initially beneficial mental relaxation spreads to your motor skills. The dart board becomes blurry and your hands won't perform the tasks your alcohol-addled brain demands of them. Passing out, of course, represents the low point of your competitive abilities (not to mention any other plans you've made for the evening); nobody's ever won a shuffleboard game while slumped on a bar stool. Still, unless you have money riding on the contest (which an unfortunate many do), there's always next weekend. It's not as if these are major sports upon which reputations and sponsorship deals ride, right? Or are they? Where do we draw the line between a game and a sport? Pool, snooker, darts, and bowling all boast organized, professional leagues or tournaments, the likes of which are regularly seen on ESPN 2. And ping-pong is in the Olympics. These games require sharp hand-eye coordination and intense focus like any other sport, so should they be regarded with the same reverence reserved for football or baseball? This debate will continue to rage -- or simmer, anyway. But those clamoring to win credibility for their favorite bar game might want to take cautionary note: one documentary suggests that the promotion from game to sport may not be all that it's cracked up to be. Foos: History of American Foosball chronicles the rise to prominence (and fall from grace) of foosball, that ubiquitous tavern staple featuring little plastic men on sticks who spin wildly about in the pursuit of a miniaturized ball. Though it is an endangered spectacle in today's taverns, foosball was once king among bar games, attracting hustlers and spawning tournaments that paid out hundreds of thousands in prize winnings. Foos chronicles the development of the sport, first as a transplanted novelty from Germany ("foosball" is the American transliteration of the German word for soccer), then, during the early '60s, as a magnet for streetwise hustlers who practiced in their garages in order to fleece unsuspecting opponents of their hard-earned quarters. The game grew in popularity until, along with shag rug and disco, foosball was a staple of '70s America. Sponsorship deals were awarded to the top foosballers, who could make a comfortable living on the professional tour. They gave themselves nicknames like "Sloppy Joe", and counted among themselves controversial icons like Johnny Horton -- a manic, cocksure, and hopelessly self-destructive champion who is given plenty of screen time in this documentary to detail his greatest foosball triumphs and explain why he's been banned from most foosball tournaments around the country. The game even created regional rivalries, pitting Minnesota foosballers against the equally skilled Texas 'ballers. Similarly, players also gravitated toward brands of tables. You were either a Dynamo or a Tornado player -- a bit like the Jets and the Sharks, though these rumbles were settled on the table. Incredibly, foosball grew so popular that it was featured by ABC news, 60 Minutes, and none other than Sports Illustrated. It seemed that nothing could stop the foos from taking over the sporting world. It was poised on the verge of moving from an obscure bar "game" to become a legitimate professional "sport". That was, until a big yellow head changed everything. The '80s saw the birth of the video game. Pac-Man, along with Space Invaders, muscled in on the scene and was soon attracting quarters away from the once crowded foosball tables. Indeed, the wocka-wocka of Pac-Man's pellet gobbling was the death knell for the game, relegating it back from the verge of sport-hood into obscurity as tournaments failed to attract sponsors and winners' checks began to bounce. There were accusations, lawsuits, and one player even committed suicide. For a game once so poised for mainstream success, Foos records that the fall from grace was calamitous and swift. Still, much like the retro chic of roller derby or El Caminos, foosball somehow survived its collapse and continues to persist today -- somewhere in the outermost reaches of popular culture, or in the most ironic of urban taverns. Having once flirted with popular acceptance, the game now seems content to return to its roots, after a fashion, offering a chance for dedicated aficionados to enjoy themselves in their relatively unnoticed corner near the back of the bar. 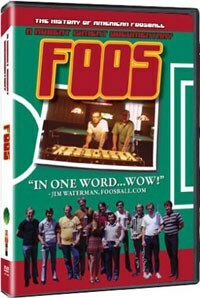 Such persistence, in fact, is perhaps best demonstrated by the documentary itself, a product of director Robert Ismert's own enthusiasm for, and involvement with, foosball and its practitioners. This also explains why the move runs so insufferably long, as rare '70s footage, replete with amateur commentary, records tournament after tournament of pro foosers, their feathered hair dampened by the sweat of intense competition. Foos: History of American Foosball is certainly not for the casual fan but, then again, neither is the game. There may be reason enough to play if the pool tables fill up on a busy Friday night, but only the few and fanatical will actively seek out a table, or this film. Perhaps the most obscure of hipsters might appreciate the soundtrack, which features the folk-rock stylings of Gary Paulak playing songs inspired by, and narrating, the ups and downs of the foosball world. But the film is most valuable for the way in which it charts the unspoken, though steadfast, line of demarcation that prevents a game from becoming a sport. Such a prohibition, of course, meant the fall of foosball, but in that fall lies a valuable lesson: a game is not to be taken too seriously. Foosball, like most things you can do at a bar, is meant for fun and relaxation -- over a beer, let's say. Or maybe two.